There are a few animals that have successfully built for themselves the most flabbergasting reputations. One such animal is definitely the chameleon. Apart from the fact that it has biologically adapted itself to change its colour as a visual signal of its mood and behaviour, i.e. an indication of if its aggressive, happy or willing to mate for example, the chameleon has also made its way into the core of many myths. Many Bantu cultures, for example, are familiar with chameleon playing an important role in the myth of the origin of man and of man’s death. It is said that the chameleon found an unusual species (a man and a woman) in its fish trap and astonished, showed these strange creatures to its god (Mukungu). The God decreed that the human race is worth living and they were thence given a place on earth. Back then, humankind was immortal, and multiplied in abundance, such that the gods, who then lived on earth, retreated to the heavens. Upon leaving, the gods gave the chameleon a message to take to the people – they would die but return to life. They gave the lizard a different message – men would die and not return. Since the chameleon is known to be slower, the lizard arrived first with his message and so men became mortal. Now, 3014 A.D. another tale is told of a peculiar chameleon, the Atlas chameleon, with the exceptional prowess of transforming into an artist. It is said that, not only could this chameleon metamorphose into a practicing artist, but also could it express itself artistically through diverse media such as painting, performance or even photography. Like any other myth, it is difficult to say where historical facts end and where fantasy or fiction starts, but this not withstanding, so-called antique evidence in the form of photographic material and even more archaic recordings through videos, and remnants of a popular medium of the time – called internet – dated around 2010-2014 A.D. show that this chameleon was indeed an artist. It is also rumoured that the Atlas chameleon adopted the pseudonym Yassine Balbzioui, with which it signed most of its paintings. Analyses of these paintings and other antique recordings by art historians reveal that the Atlas chameleon’s paintings seemed to have been a politico-social parody of its time. A recurrent motive in many of the painting series attributed to the chameleon is a kind of masking. Masks of all dimensions, colours and forms. The question that automatically arises is whether the masks are a statement for a carnivalesque appropriation or if the masks serve primarily as a means of hiding, and thereby subconsciously revealing something intended to be hidden. Take the case of the functional masks that look like gas masks, but worn by children, as in Jeux d’enfants, 2013. The children that take centre stage in this series all wear work gears. There is a something awkward in the air, as the protagonists stir at a figure that might be the artist or the beholder while sitting in a wheelbarrow or posing arm in arm. It is the darkness from which they emerge, this cave-like atmosphere that makes this painting series particularly mysterious. The concept of the mask continues in the series Le troisième masque, 2012 wherein young girls have their faces hidden behind horse head masks. A strange symbolism that is almost ununderstandable in our times. Historical material of that era suggests that there existed a culture of young girls being particularly fond of horses, but also that era was plagued by various scandals of horse meat being put in all sorts of canned food – with or without meat or instead of beef or swine. Could this practice have so much shocked the artist into representing kids with horse masks? Anyways, as of now there is no evidence why the artist would choose such a symbolism. Another typical example is the series Plastic man, 2012 in which faceless young men are portrayed. Faceless because they mask the carry to cover their visages are plastic bags. Suffocating images to see. Whatever is profound loves masks; what is most profound even hates image and parable. Might not nothing less than the opposite be the proper disguise for the shame of a god? (…) It is not the worst things that cause the worst shame: there is not only guile behind a mask – there is so much graciousness in cunning. (…) Every profound spirit needs a mask: even more, around every profound spirit a mask is growing continually, owing to the constantly false, namely shallow, interpretation of every word, every step, every sign of life he gives. If Nietzsche were to be right, then he made a strong case for masking here. A choice of a mask reveals how one perceives oneself or how wants to be perceived by others. Intentionality plays a primordial role here, as an unintentional wearing of a mask might reveal something in the subconscious, but might also lead the beholder into perceiving a different you than what you really are. On the other hand, an intentional choice of a mask might just be appropriating a specific role as in a play that might lead the beholder astray. With regard to profundity, Nietzsche seems to make the mask an unbeatable accessoire of any profound spirit – either by choice, i.e. intentional or by imposition, i.e. by the observer’s misinterpretation or misperception. 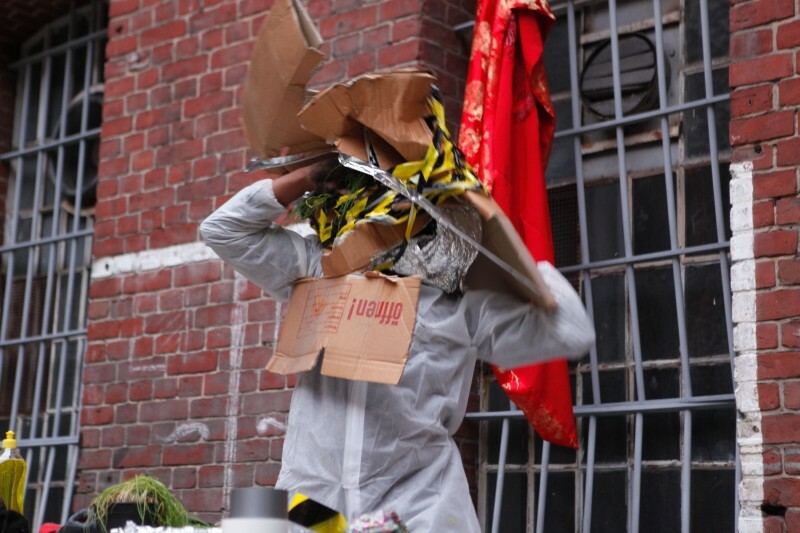 In any case, the performative act of choosing, and playing with the philosophy of the mask, the psychology of the observer seemed to be the crux of the chameleon’s artistic practice. A metaphor is still told to date that the blood that flowed in the veins of the chameleon’s works was one that had humour as the red blood cells and zeal to entertain as the white blood cells. It is said that the chameleon never pretended to be one of those intellectual artists, but rather an authentic artist that trusted his instincts and relied on these very basic emotional and instinctive approaches that are known to cause a chill run down one’s spine. Archeologists recently found excepts of what they claim was one of the most enticing performances the chameleon ever made called Grosse tête. The researchers further revealed that Grosse tête was a kind of mutant creature Balbzioui instantaneously created by plastering stuff on his head to form a gigantic mask. This stuff could be cartons, plastic bags, pots, glass etc. The myth holds that the audiences were always caught up in a state of despair and at the same time great astonishment, as they saw the artist struggle to put some holes in this object on his head, so as to get some air to breath. It was not unusual that people in the audience left the space for fear of witnessing the unutterable. The performances went on and the tumour became bigger until Balbzioui, at the brink of suffocation, frantically tore down the tumour. Was Grosse tête the ego that threatened to throttle the artist, the politician, the layman on the street? Was Grosse tête megalomania that accompanied one on the way to success, but suddenly relaxed its grip when one was at the top? These questions cannot be answered by the archeologists and art historians, but they further revealed more information on who the chameleon might actually have been. With a 99% probability, they say it must have been Yassine Balbzioui – born in Morocco in 1972, records state that Balbzioui studied art at the School of Fine Arts in Casablanca, Morocco, School of Fine Arts in Bordeaux, France and at the University California (UC). The name was found in antique exhibition records, meaning that he exhibited in the International Museum of Women in San Francisco, the National Museum of Mali, at Dak’art Off, Savvy Contemporary Berlin, Iwalewa Haus Bayreuth, «BijlmAIR» Program of CBK Zuidoost, the Berlin Biennial or the Marrakesh Biennial. He lived and worked between Paris, Bordeaux and Berlin. The consensus is that the myth of the chameleon stemmed from Balbzioui’s ability to change his colour according to his mood and spirits, which were reflected in the forms of a painter, sculptor, installation or video artist, musician and above all a performer. His affinity to perform and ignite a conversation with the audience was reflected in most of his works, but especially in the piece Grosse tête.